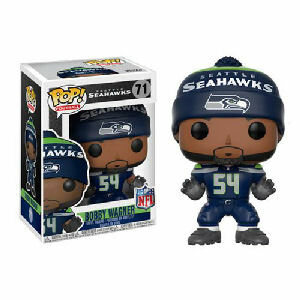 We have Just Sold out of NFL Bobby Wagner Seattle Seahawks Home Wave 4 Pop! Vinyl Figure #71. This Item is unavailable at present. From the NFL Seattle Seahawks Pop! Vinyl collection by Funko. NFL Bobby Wagner Seattle Seahawks Home Wave 4 Pop! Vinyl Figure #71. Measures 3.75 inches high. The sylized figure has a rotating head and comes in a displayable window box. Funko National Football League Pop! Vinyl shipping from Canada. No Surprise Border fees or Customs!